You’ll fall in love with the smooth and elegant flavor. 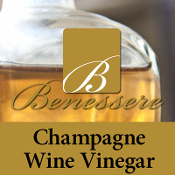 This champagne vinegar never undergoes a pasteurization process leaving it with a lovely, rich base. Imported from the Champagne region of France, this vinegar is divine in a homemade mayonnaise whisked with olive oil, eggs and mustard.